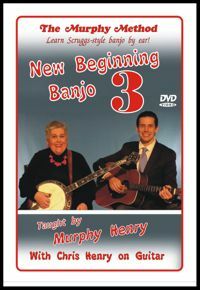 New Beginning Banjo 3 (High Definition): Learn to play higher on the neck. Learn some new chords. Tackle some bluegrass classics. Yes, the tunes are harder but you are ready for them! Go for it! Foggy Mountain Breakdown (high break), Old Joe Clark, Lonesome Road Blues, Roll in My Sweet Baby’s Arms, Salt Creek.